This hearty and satisfying vegan meatloaf is deliciously simple comfort food is richly flavoured and is particularly yummy served with onion gravy! Preheat the oven to 175 degrees Celsius. Pour the hot veg stock over the protein-rich soya mince in a large mixing bowl. Add the tomato puree and tomato ketchup. Mix well and leave to absorb and rehydrate the mince. Meanwhile, fry the onion; celery; carrot and thyme with plenty of olive oil. When well fried (a bit of colour to the onion will add flavour and some sweetness), add all of the tasty veg to the soaked soya mince along with the parsley and thyme and mix it through. Sprinkle in the nutritional yeast, salt, pepper and garlic granules and mix again. Shake in the gram flour a little at a time folding into the mixture as you go until it firms up enough to hold a shape. Lightly grease a baking tray and tip out the mixture onto the tray and shape into a square loaf about 2 inches deep. Oil the top of the loaf, season with a little more black pepper and stud with rosemary sprigs. Bake in the centre of the oven for 45 minutes. When cooked, the mixture will be firm and have a great meaty texture. 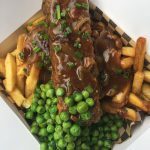 It’s perfect to serve alongside roasted autumn squash, black cabbage and mashed potatoes but at Rudy’s we prefer it served on a huge heap of French fries with loads of herby peas and lashings of onion gravy.